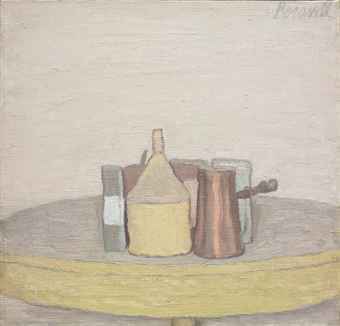 I think one of the most underrated artist of our time is Giorgio Morandi. He's known for his still life paintings. I think they are just beautiful. I love the subtle colors he used and simple silhouettes; no wonder his work is often referred to as the precursor of minimalism movement in 20th century. This particular painting, to be auctioned by Christie's, is a perfect example of his oeuvre; lyrical and sublime. Love the way he cropped off the side of the table as well as the table legs... forcing the viewers to study the shape and color of the objects in the middle.